The First Circuit recently found that a UCC filing amendment naming the debtor contained an appropriate name and that, when coupled with a corrected collateral description in the amendment, the bondholders’ lien was perfected and therefore unavoidable under the “strong-arm” provisions of the Bankruptcy Code. A recent decision of the United States District Court for the District of Delaware has provided further support within the Third Circuit for so-called “gift” plans (i.e., plans in which a secured creditor class “gifts” a portion of its plan distribution to a junior class). 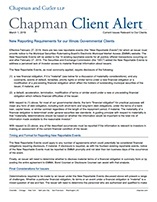 In two recent cases, the Court of Appeals for the Seventh Circuit held that the Illinois Department of Revenue could not collect delinquent retail and sales taxes from the proceeds of assets sold pursuant to section 363 of the Bankruptcy Code. 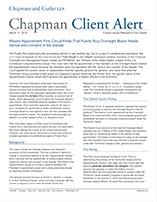 The United States Court of Appeals for the Ninth Circuit issued a decision reversing a lower court’s order that designated the vote of a secured bank creditor that had purchased claims from a subset of unsecured creditors for the admitted purpose of blocking confirmation of the debtor’s plan of reorganization. This article addresses the benefits to a senior secured lender of Representations and Warranties Insurance, and certain considerations financial institutions should make in documenting a middle market loan transaction when an acquisition financing utilizes RWI. Intercreditor agreements are commonly used to define the relative rights of senior and junior lenders, especially should the borrower become distressed or file bankruptcy. Properly defining priorities between lenders is particularly important when both parties possess security interests in the same collateral. 11 U.S.C. § 1111(b)(1)(A) provides that a creditor holding a non-recourse lien on real property possesses a claim against a debtor’s bankruptcy estate upon the filing of the bankruptcy petition. But what happens to the secured creditor’s non-recourse claim when the property securing the loan has been sold via foreclosure? Before purchasing any debt, distressed investors need to be mindful of what unrestricted subsidiaries are and how they may impact the overall credit of a company or debt recoveries. 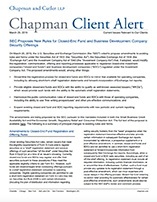 What You Need to Know about "Unrestricted Subsidiaries"
Investments in “unrestricted subsidiaries” are an exception to investment covenants, which have been used in an attempt to provide flexibility in restructuring a company’s capital structure. Lenders and investors in companies often have assumed that claims related to the purchase and sale of securities are subordinated to the level of the underlying security in question. However, a recent decision has raised a serious question as to when claims for damages should be deemed “arising from” the purchase or sale of a security. The services agreements under which midstream oil and gas companies operate are routinely structured as long-term contracts requiring a large initial expenditure. 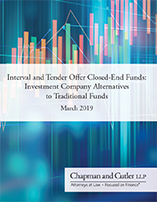 In these cases, the midstream service providers’ investment is only recouped over the life of the agreement, and early termination or rejection of such agreements can be devastating. Federal law creates an exemption from environmental liability for lenders under the federal Comprehensive Environmental Response, Compensation, and Liability Act, which provides that a party who owns or operates a facility can be held responsible for cleaning up hazardous waste at or from the facility regardless of whether that party caused or contributed to the contamination. 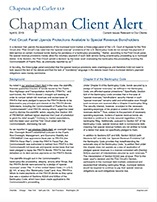 The Banking Law Journal published an article based on a recent Chapman Client Alert. 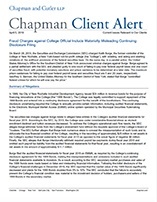 As discussed in our previous client alert on this subject, litigation over whether $1.5 billion in prepetition loans to GM were secured or unsecured has been pending before the Second Circuit Court of Appeals. 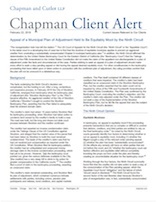 The Second Circuit recently issued a decision upholding the termination. I'm a Secured Creditor so I'm Entitled to Default Interest, Right? 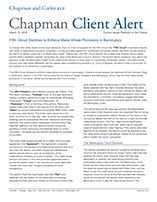 Pratt's Journal of Bankruptcy Law published an article based on a recent Chapman Sidebar. 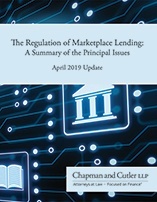 “Acquisition Financing,” or the funding of capital for the purpose of acquiring a target company, is a growing specialty area among bank lending attorneys. 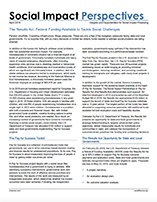 Recent Challenges to Credit Bidding - A New Trend? Two recent bankruptcy court decisions from the District of Delaware and Eastern District of Virginia raise serious concerns for secured lenders and purchasers of secured loans in the secondary market. The United States Supreme Court issued its decision in the RadLAX Gateway Hotel v. Amalgamated Bank case on May 29, 2012, closing the door on a debtorʼs end-around a secured creditorʼs right to credit bid.1 In a unanimous decision delivered by Justice Scalia, the Supreme Court found its answer to be “an easy case,” rejecting recent decisions allowing a debtor to sell secured property free and clear of all liens without providing for the secured partyʼs credit bid rights when the sale was pursuant to a plan of reorganization.2 The decision provides secured creditors with predictability and consistency whether its collateral is being sold pursuant to a proposed plan or a sale during the bankruptcy case.